Anaheim Automation offers a line of single-ended or differential Incremental Rotary Encoders. These low-cost, ruggedly constructed encoders are available in sizes to cover NEMA 08 to 42 motors. These Incremental Rotary Encoders have the capability to track from 0 to 100,000 Cycles Per Second, with options of 32 to 5,000 Cycles Per Revolution (CPR), with or without index features. Encoders are configured as motor adders, for dual shaft motors. Encoder cables are available, but purchased separately. Anaheim Automation is pleased to add incremental rotary encoders to any dual-shaft motor. This series features 100 to 1000 Cycles Per Revolution (CPR). These single-ended output type encoders are designed for cable lengths up to 10 feet. It is recommended to use shielded cable for all encoder wiring. 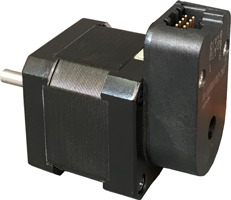 *The Miniature, Single-Ended Encoder Without Index Series is compatible with Anaheim Automation's 08Y Stepper Motors and BLWRPG17 BLDC Gearmotors. Anaheim Automation is pleased to add incremental rotary encoders to any dual-shaft motor. This series features 100 to 1000 Cycles Per Revolution (CPR). These differential output type encoders are designed for cable lengths greater than 10 ft. It is recommended to use shielded cable for all encoder wiring. *The Miniature, Differential Encoder Without Index Series is compatible with Anaheim Automation's 08Y Stepper Motors and BLWRPG17 BLDC Gearmotors. Anaheim Automation is pleased to add incremental rotary encoders to any dual-shaft motor. This series features 32 to 1,250 Cycles Per Revolution (CPR). These single-ended output type encoders are designed for cable lengths up to 10 feet. It is recommended to use shielded cable for all encoder wiring. Anaheim Automation offers Encoder Cable, which is purchased separately. *The Single-Ended Without Index Series is compatible with Anaheim Automation's 11AV, 11Y, 11YPG, 14Y, 15Y, 17AV, 17L, 17Y, 17YPG, 23D, 23L, 23W, 23Y, 23YPG, 23YSG, 24Y, 34D, 34K, 34N, 34V, 34W, 34Y, 34YSG, 42K, 42N, and 42Y Stepper Motors. Compatible BLDC Motors include: BLWR11, BLWR13, BLWR23, BLWRPG11, BLWRPG23, BLWS23, BLWS24, BLWSG23, BLY17, BLY34, and BLYSG34. The following Single-Ended Without Index Series are compatible with Anaheim Automation's 23AV Series Linear Actuators only. Anaheim Automation is pleased to add incremental rotary encoders to any dual-shaft motor. This series features 50 to 1,250 Cycles Per Revolution (CPR). These single-ended output type encoders are designed for cable lengths up to 10 feet. It is recommended to use shielded cable for all encoder wiring. Anaheim Automation offers Encoder Cable, which is purchased separately. *The Single-Ended With Index Series is compatible with Anaheim Automation's 11AV, 11Y, 11YPG, 14Y, 15Y, 17AV, 17L, 17Y, 17YPG, 23D, 23L, 23W, 23Y, 23YPG, 23YSG, 24Y, 34D, 34K, 34N, 34V, 34W, 34Y, 34YSG, 42K, 42N, and 42Y Stepper Motors. Compatible BLDC Motors include: BLWR11, BLWR13, BLWR23, BLWRPG11, BLWRPG23, BLWS23, BLWS24, BLWSG23, BLY17, BLY34, and BLYSG34. The following Single-Ended With Index Series are compatible with Anaheim Automation's 23AV Series Linear Actuators only. Anaheim Automation is pleased to add A5SI incremental rotary encoders to any dual-shaft motor. This series features 50 to 5,000 Cycles Per Revolution (CPR). Those single-ended output type encoders are designed for cable lengths up to 10 feet. It is recommended to use shielded cable for all encoder wiring. Anaheim Automation offers Encoder Cable, which is purchased separately. Anaheim Automation is pleased to add A5SN incremental rotary encoders to any dual-shaft motor. This series features 32 to 1,250 Cycles Per Revolution (CPR). Those single-ended output type encoders are designed for cable lengths up to 10 feet. It is recommended to use shielded cable for all encoder wiring. Anaheim Automation offers Encoder Cable, which is purchased separately. Anaheim Automation is pleased to add incremental rotary encoders to any dual-shaft motor. This series features 1,800 to 10,000 Cycles Per Revolution (CPR). The single-ended output type is normally designed for cable lengths of 10 feet or less. It is recommended to use shielded cable for all encoder wiring. Anaheim Automation offers Encoder Cable, which is purchased separately. *The High Resolution Single-Ended With Index Series is compatible with Anaheim Automation's 11AV, 11Y, 11YPG, 14Y, 15Y, 17AV, 17L, 17Y, 17YPG, 23D, 23L, 23W, 23Y, 23YPG, 23YSG, 24Y, 34D, 34K, 34N, 34V, 34W, 34Y, 34YSG, 42K, 42N, and 42Y Stepper Motors. Compatible BLDC Motors include: BLWR11, BLWR13, BLWR23, BLWRPG11, BLWRPG23, BLWS23, BLWS24, BLWSG23, BLY17, BLY34, and BLYSG34. Anaheim Automation is pleased to add incremental rotary encoders to any dual-shaft motor. This series features 50 to 5,000 Cycles Per Revolution (CPR). It is recommended to use shielded cable for all encoder wiring. The differential series is ideal for cable lengths that are greater than 10 feet. Anaheim Automation offers Encoder Cable, which is purchased separately. *The Differential With Index Series is compatible with Anaheim Automation's 11AV, 11Y, 11YPG, 14Y, 15Y, 17AV, 17L, 17Y, 17YPG, 23D, 23L, 23W, 23Y, 23YPG, 23YSG, 24Y, 34D, 34K, 34N, 34V, 34W, 34Y, 34YSG, 42K, 42N, and 42Y Stepper Motors. Compatible BLDC Motors include: BLWR11, BLWR13, BLWR23, BLWRPG11, BLWRPG23, BLWS23, BLWS24, BLWSG23, BLY17, BLY34, and BLYSG34. Anaheim Automation is pleased to add incremental rotary encoders to any dual-shaft motor. This series features 32 to 1,250 Cycles Per Revolution (CPR). It is recommended to use shielded cable for all encoder wiring. The differential series is ideal for cable lengths that are greater than 10 feet. Anaheim Automation offers Encoder Cable, which is purchased separately. *The Differential Without Index Series is compatible with Anaheim Automation's 11AV, 11Y, 11YPG, 14Y, 15Y, 17AV, 17L, 17Y, 17YPG, 23D, 23L, 23W, 23Y, 23YPG, 23YSG, 24Y, 34D, 34K, 34N, 34V, 34W, 34Y, 34YSG, 42K, 42N, and 42Y Stepper Motors. Compatible BLDC Motors include: BLWR11, BLWR13, BLWR23, BLWRPG11, BLWRPG23, BLWS23, BLWS24, BLWSG23, BLY17, BLY34, and BLYSG34.